A sanctuary of wine where nature is free to express herself without interference. A unique process of vinification in tune with the energy of the grapes and the creativity of man. A wine that becomes a lifestyle. If you visit Cà del Vént, don’t expect a classic winery with a modern, streamlined look. Cà del Vént is located in Campiani di Cellatica, an ancient wine zone in the northern Italian region of Lombardy, where it shares its eastern border with Franciacorta. A secret garden cared for by a handful of visionary winemakers, the place is far off the beaten path both literally and figuratively. Its practices are inspired by biodynamic concepts that serve nature and the territory’s unique particularities. Beyond the DOP appellation, being organic, and even beyond science, the well-trained and determined men who produce these wines are knightly custodians of their land. Day after day, they guide their crops through their cycles of life, using no chemicals nor machines of any kind. Their wines truly let nature express herself freely, and she repays them by giving the wines character, incredible flavor, and soul. Their ideals may seem exaggerated and even a little eccentric, but the Cà del Vént winery almost feels like a mystical sanctuary dedicated to the gods of wine. Grass grows higher than a meter tall between the lines of vineyards, a wavering sea of green caressed by the wind and vibrating with life in time with the grapes and arcane sound of Tibetan bells that hange by their winery. “The concept of agriculture itself is unnatural,” explains Flavio, native to the province, an agronomist, enologist, and spiritual master of the vines (and soul). “Cramming seven thousand vines on one hectare of land creates an artificial monoculture. Why interfere with natural processes just to cater to our aesthetic appeal? People don’t come here to our vineyards to take a leisurely walk through the vines and take pictures. Here, we make wine, and we want to be sure nature is free to grow and express herself. Listening to Flavio is perhaps the best way to understand the winery’s philosophy and mission. His strong arms affirm his hard work in the vineyards, and his long, dark hair pulled back in a ponytail gives him an aura of maestro while he speaks calmly and disarmingly of his complex, fascinating work. From the time he began studying agriculture, he knew he was destined to work in wine. After graduation, he specialized in enology at the Bordeaux University and, during his studies, worked with a Friulian enologist that taught him fieldwork fundamentals. Flavio did not know, however, that his destiny was to unfold just a few steps away from his home. In 2006, the owners of Cà del Vént, whose grapes had previously been consigned to a communal winery, asked him to work with their wines. They had previously abandoned this rather common mode of winemaking for small Italian families in 1996, and began to produce wine on their own using simple instruments shared by local families. To Flavio, it was a unique opportunity: the manual and natural methods they used formed an essential point of departure for his own biodynamic experiments. With a clean slate all his own, he began his biodynamic wine making adventures. Cà del Vént, which means “House of Wind,” was given its name during the Napoleonic era for obvious reasons, and is a naturally fertile area. Its diverse lands are crisscrossed with an intricate system of underground springs. In fact, 13 separate ecological microzones are recognized. For each one, they chose a separate, suitable nursery whose grapes are never mixed with those from the other nurseries; come harvest, one can taste the differences between each microzone, each vine. It is the real and true soul of the land. Cà del Vént wines do not follow protocols, and have no lables or denominations under which they may be categorized. Every vintage is unique, expressing the properties of the water the roots absorb, the wind that brushes the grapevine leaves, and the intuition of the enologist who creates this product of nature, alive and rare. The moment of harvest and vinification is decided by tasting the grapes. The creative process that follows begins with nature and finishes with the winemakers tiptoeing through their cellars, making as little disturbance as possible with the natural course of winemaking: no refining, decanting, or filtering. 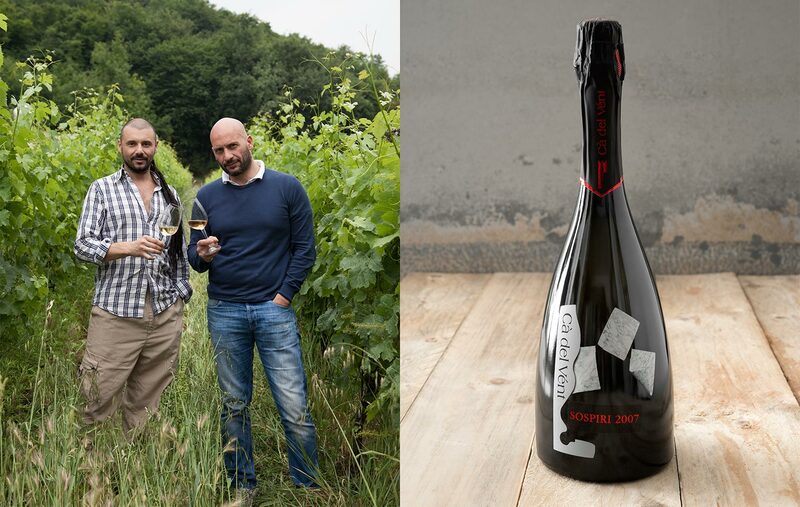 To taste a Cellatica, Clavis, Curtefranca, or Franciacorta Brut from Cà del Vént is an experience that involves more than the tastebuds, a sip of wine that resounds in the mind, body, and soul. The few bottles produced annually are always exclusive editions, accompanied with thoughtful notes to help the consumer taste, understand, and ponder. We depart from Cà del Vént with wine in tow, cradling these bottles that seem almost alive. We will let them whisper their story and their secrets to you over a long, slow dinner.